In my vision of a perfect world, all breweries would have a calamity tank. What the heck is a calamity tank? It’s a wastewater tank, normally empty, that can be used for spills, bad beer, and storage. Imagine this scenario, during pump over from the whirlpool to the fermenter, someone left a valve open and an entire brew just went down the drain. No problem, switch a few valves outside and your lift station can put this water in the calamity tank. If this brew were to just go down the drain, this would create a ‘slug load’ at the wastewater treatment plant. Slug loads are usually illegal, they can cause a lot of problems at the treatment plant. And the operators could trace it to your brewery. Since you depend on that wastewater treatment plant for your operations, you want to do what you can to keep it functioning smoothly. 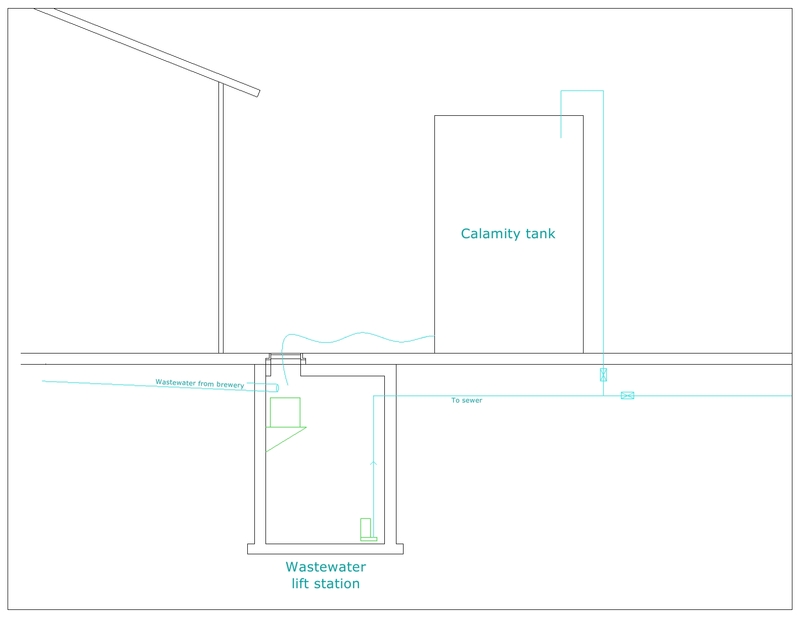 Other scenarios where the calamity tank is useful is if a propylene glycol line breaks in the cellar, or if a large chemical spill happens. A propylene glycol solution is probably what your brewery is using to keep the fermenters cool and the bright beer tanks cold. It works great, but if it spills it becomes wastewater and it is very high strength. If a large chemical spill were to happen, such as a valve left open, a siphon occurred, or there was an accident, the last thing you want to do it try to clean it up. Switch over to your calamity tank, then send that spill down the drain. Once again, this will isolate the spill in the calamity tank and you can figure out what to do next at your leisure instead of in a panic. Once the material is in the calamity tank, what to do with it? You could slowly add it in to the sewer stream over several days. You could also load it in to a truck and haul it off site. The main point is now you have time to come up with a plan.